Haddington in East Lothian is busy co-producing the future of its town centre – building a bright future by businesses, local authority and the community working together to plan and delivery change. It’s an exciting initiative, not least because of the increasing collaboration and power-sharing that’s taking place, as I explain here. The framework for action is the vision for the town centre, prepared collaboratively in 2012. One of the action themes in the vision is Youth Enterprise. It’s all about making Haddington a better place for young people: a town they want to stay in or come back to, and where they can realise their ideas, from music to sport to thought. Glasgow-based social enterprise Space Unlimited has a reputation for innovative and thoughtful work with young people. Young people are the catalysts in Space Unlimited projects because they see things differently, approach problems imaginatively, and aren’t afraid to say what they think. Space Unlimited facilitators are there to create a safe space for young people to explore ideas, take responsibility, broker relationships and turn their ideas into action. 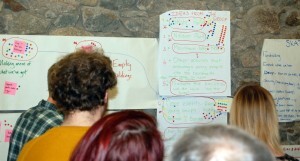 How can we work with young people in the new vision for Haddington’s town centre? And ensure their ideas and opinions are heard, taken seriously and acted on? This was a quest into the unknown for those eight young people. Scary, exciting, nervous and rewarding were some of the words they used. As their quest progressed over the two days, the young people took more and more responsibility – so that by the end, they had developed actions and principles that they wanted to take forward. At the end of the second day, they presented their ideas to a group of influential people from Haddington Town Centre Vision Committee, East Lothian Council, Knox Academy and local social enterprises – who in turn agreed to help them take things forward. Roll out youth enquiries to more young people in the town, to build a wider platform for action and get a more representative view of what young people want. Support young people to take their ideas forward – skateboarding and music being the two action ideas that this group wanted to take forward. There could be other ideas around too. Some action will by led by adults, others by young people. Skateboarding and music should be led by young people with support from adults and organisations. Other things, like better public transport or improving Neilston Park, will be better led by adults or organisations, in close consultation with young people. Action is vital – it will demonstrate to young people that it’s worth getting involved. Young people should be encouraged to be ambitious and creative, but also realistic about what can be achieved. Space Unlimited is now brokering relationships amongst key people and organisations in the town, encouraging them to plan for action, and looking for funding and resources. We are involving some of the young people who attended the youth enquiry in this. Our focus will be on helping the community to work out how it can take forward the three priorities for action that emerged during the youth enquiry. In the medium to long term, we’ll be urging local organisations – especially the new Community Development Trust, the guardian of the town’s vision – to take responsibility for supporting young people to take forward their ideas themselves and involving them in other parts of the vision.